Brew Bayou. The Venice Cafe. Mokabe's. The Oasis. The Grind. Sacred Grounds. The Mud Room. The tables were often unsteady, the chairs did not match, and the coffee was of uncertain quality. But coffee houses draw English majors into their dim, warm interiors to compose innumerable sonnets or free verse as they try to figure out life, love, and iambic pentameter. 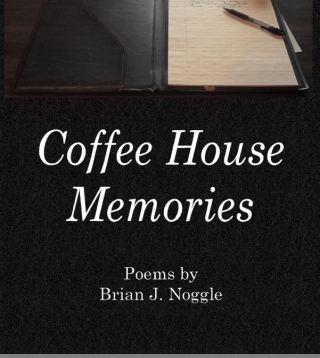 Within this collection, one such poet-narrator muses on those very topics as he sought to transition from youth to adult, and then he reflects upon those days when he spent those hours in coffee houses. or maybe to your dorm–I’ll never know. Brian J. Noggle, I mean “I,” graduated from Marquette University with a degree in Writing Intensive English (and Social Philosophy). They say with an English degree, you can do anything; what that means, though, is you can work at any sort of dead-end job and spend your nights drinking coffee and dreaming of being a real writer. I did my share of that. My other writing work has appeared in small literary magazines (Artisan Journal, Show and Tell, and whatnot), national periodicals (History Magazine and Writers Journal), and trade publications (The Testing Planet). Copyright 2018 Brian J. Noggle.